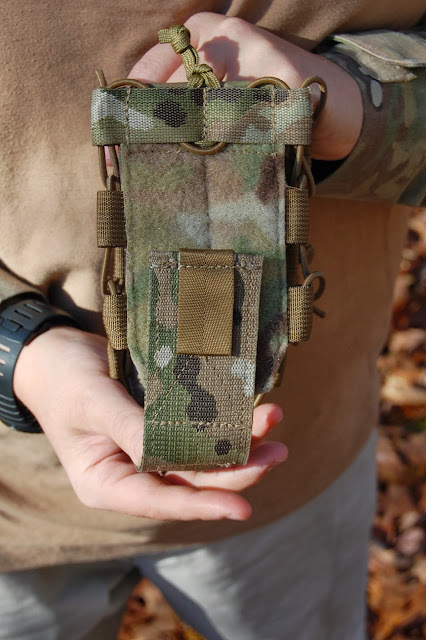 There are a lot of great modular pouches on the market today. The Gear Locker has shared with us a review with some of the top in the industry. As equipment manufactures strive to build gear that is lighter, lower IR signature, and modular they have left no stone unturned. From the rigs themselves to the pouches, all are fair game in the era where our war fighters are fighting at altitudes that were just the realm of climbers. For those that use Airsoft as a training tool, they also benefit from the new technology. 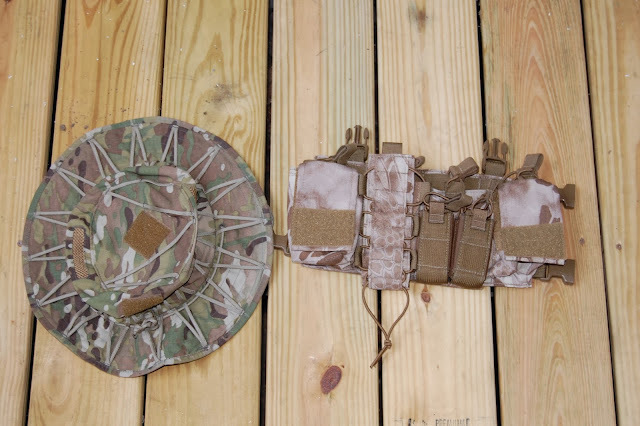 For this review, we are going to compare three different modular magazine pouches. The list is: HSGI Soft TACO, HSP D3 Chest Rig’s StuffIt Pouch, and MSM Bottle Corsett. Each of these pouches are designed to hold M4 Magazines or other items. For our review, we cover how they operate, and their functionality. First on the list is the HSP D3′s StuffIt pouch. It is designed as small, stuffIt style pouch that a user can put just about anything into. It was designed to be a pouch that is user definable. It works great on the D3 Rig, but is limited in size and width. When I tested the Chest Rig, I used it for stuffing my Dead Rag into. It was a great pouch for those smaller items. Next up is the MSM Bottle Corset. It is a pouch that is designed to hold a water bottle by adjusting the shock cord sides and the bottom. There is a Velcro flap that can be adjusted depending on the length of the device. But, you can hold more than your standard water bottle. You can also hold magazines because of the shock cord and adjustable “floor” of the pouch. When you get the pouch, you will see that it is flat with the shock cord extended all the way. The best way to size the pouch is by placing the bottle or magazines (yes you can do a double stack) into the pouch and adjust the cord around it. What I found to have issues is the Velcro floor. Over time, use and adjusting that floor will weaken that Velcro, which could lead to the items in that pouch to be expelled. You also have a snag hazard possiblity as you traverse through brush or wooded areas. I would have preferred a solid floor to the pouch and different design. And Finally, we have the Soft Taco from HSGI. This is another version of their TACO product. 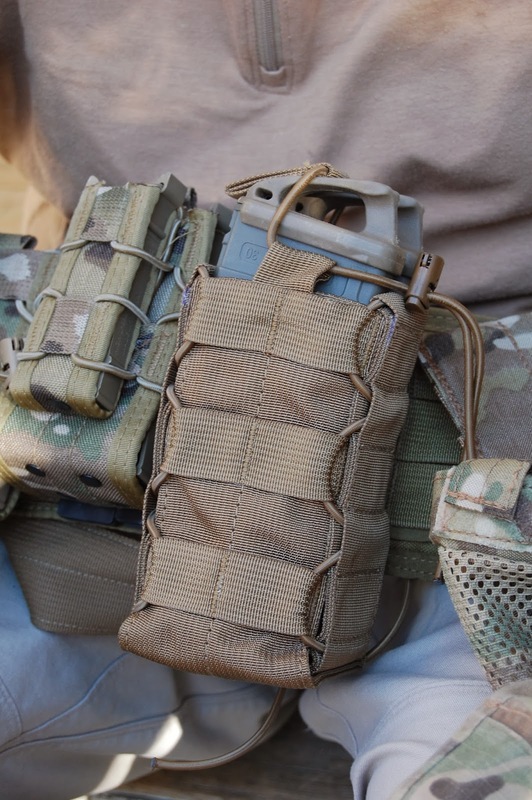 For their soft TACO, HSGI went non-ridgid (hence the name) and designed it to be used for securing water bottles or magazines of what ever you choose. Like it’s brother, the hard TACO, this pouch has adjustability by using the shock cord that covers its sides. Of all 3 pouches, TGL felt the soft TACO worked the best and was the most versitle. It eliminiated the failure point of having an adjustable “floor” of the pouch and having solid sides instead of just using the shock cord to act as the side walls as the MSM Bottle Corsett does. And, the size of the overall pouch allowed it to be used with more items unlike the StuffIt.